Lynch’s second novel is the sequel to “The Lies of Locke Lamora”. “Red Seas Under Red Skies” starts with Locke and his friend and fellow-thief Jean Tannen attempting to start a new life of larceny in the city of Tal Vellar. Their initial target this time is the Sinspire, Tal Vellar’s premier gambling establishment, whose owner Requin is rumoured to store a huge fortune inside the supposedly impenetrable vault beneath his business. Locke and Jean concoct an ingenious and elaborate plan spanning several years to relieve Requin of some of his wealth. However, just as their plan is about to come to fruition they instead find themselves enmeshed in the schemes of the Archon of Tal Velarr – the military commander of the city who decides Locke and Jean could be useful pawns in his struggle for power against the Priori – the merchant council in charge of the city. At the same time, they find themselves under attack from unknown assassins and they find their flight from Camorr has not allowed them to hide from the feared sorcerers of the Bondsmagi, who they managed to make enemies of in the previous book. Eventually they find themselves at sea, forced to pretend to be pirates in the crew of the Black Orchid, a feared pirate ship whose captain Zamira Drakashka has a long-standing enmity with the Archon of Tal Vellar. The first half of the book primarily concentrates on the background to the Sinspire job, as well as telling of their initial encounters with both Requin and the Archon. Occasional flashbacks (fewer in number than in the first book) recount some of the initial stages of Locke and Jean’s plan as well as telling the story of how they came to be in Tal Vellar. An ill-advised prologue also attempts to set up a cliffhanger to be resolved later in the book, but it fails to build up any real suspense since the resolution to the cliffhanger is easy to guess. The second half of their book is generally the more interesting, focusing on Locke and Jean’s experience as part of the crew of the Black Orchid, with occasional visits back to Tal Vellar to advance the plot. Like the first book in the series, this is a very entertaining book. The dialogue continues to be witty, intelligent and entertaining, the characters of Locke and Jean continue to be interesting and also continue to develop (both in terms of their own characters and in the changing friendship between the two men) and the plot (particularly in the later stages of the book) is compelling. The convoluted scheme to trick Requin may not be entirely plausible but it does largely make sense and the labyrinthine network of schemes Locke has to concoct once he comes to the attention of Requin, the Archon and the Priori makes the novel’s plot increasingly complicated but never stops it being easy to follow. There are a few clever twists as the story unfolds and the ending leaves things set up nicely for the next sequel. The parts of the plot concerning the pirates is also equally interesting, although it could be accused of rehashing some pirates story clichés, it is undeniably entertaining and both the ship-to-ship combat and the nautical jargon are convincingly portrayed by Lynch without ever distracting from the characterisation that is at the heart of the story. The world-building also continues to be good; Tal Vellar being portrayed almost as well as Camorr was in the first book. Although the book doesn’t have any really serious flaws, it is arguably not quite as consistently great as the first book. The plot is a bit slow to start off with, the first half of the book is largely build-up with lots of interesting situations being set up for later, which is possibly inevitable is what is largely a book about a heist. The build-up is interesting but until Locke and Jean set sail, it doesn’t really feel like the plot has genuinely started. Fortunately, what follows is entertaining enough to make up for the slow start. There are also a few gratuitous flashbacks early in the book which seem a bit out-of-place at the time and fail to be interesting on their own merits and only exist to set up some plot points for later. The characterisation may generally be good, but it starts to feel a bit repetitive after a while, it does seem a bit implausible that everyone that Locke and Jean encounter (whether they be allies or antagonists) are so witty and intelligent. Also, the first half suffers a bit since it is lacking the banter between the different Gentleman Bastards that was part of the charm of the first book. Although there is still plenty of banter between Locke and Jean it isn’t until they get aboard the Black Orchid that any really interesting supporting characters come along. Zamira and her right-hand woman Ezri are both interesting and likeable characters although many of the supporting pirates seem a bit interchangeable. 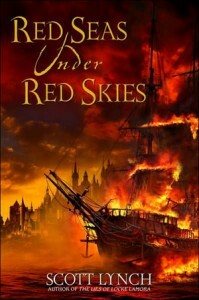 That said, even when “Red Seas Under Red Skies” isn’t at its best, it is still very entertaining to read. In summary, this is another entertaining fantasy novel by Lynch. It comes close to achieving the same level of quality as “The Lies of Locke Lamora” but falls slightly short. The next book in the series, “The Republic of Thieves” should be published in early 2011.